What comes after The Social Network? Leaving the theater, I wanted more. After almost 20 years, I’m honored to have been asked back to NASA. 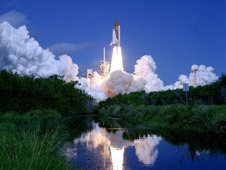 This time for the Space Shuttle launch scheduled November 1, 2010, as part of #NASATweetup. Over two days I’ll get tours and the opportunity to speak with shuttle technicians, engineers, astronauts, and managers as well as to watch the launch from the press area. Of course I’ll share on Twitter, Facebook and blog while I’m there. This is the last scheduled mission for Space Shuttle Discovery, and the Shuttle program is scheduled to end with the final Endeavor mission, STS-134 in February, 2011. [Update: the new budget approved recently adds one last mission in June for Atlantis.] My friends Rusty Hodge of SOMA-FM Mission Control and Scott Beale of Laughing Squid have been to invited to past #NASAtweetups. Our amazing guest host is my friend Gina Smith. Before I’d met her in person, I used to watch her on Good Morning America and World News Tonight. She was ABC News first Tech Correspondent, and covered the web 1.0 boom for them. She’s also the author (with Steve Wozniak) of NYT bestseller iWOZ: From Geek to Cult Icon: How I Invented the Personal Computer, Co-founded Apple and Had Fun Along the Way. Another friend is presenting: Mike Smithwick. He started writing Distant Suns for the Amiga in 1985, and I first met him during my days as an Amiga engineer. More than 25 years later and Distant Suns is still going strong, and he has new announcements to make Tuesday night. It was a great coincidence that he applied to the show without even realizing I was involved. The wraps are finally coming off the secret new project from best-selling author Neal Stephenson (Snow Crash, Quicksilver, Cryptonomicon, Anathem) and my friend Jeremy Bornstein at Subutai Corporation. It’s cool that we have custom iPad bags from Rickshaw Bag Works, and that we have Intel as a sponsor, as well as SugarSync and Appency PR, and a lineup of other great media, presenters and guests. Please grab a ticket and join us for cocktails and appetizers starting at 5:30pm!